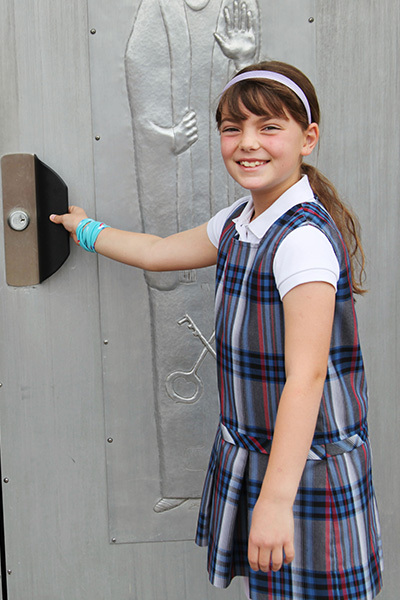 Religious worship is an integral part of a child’s growth and a central part of the school’s Catholic identity. The students attend Mass together every Friday. Friday Masses are student-led, where the children participate in every aspect of the Mass. They serve as lectors, altar servers, and sing in the choir. Some members of the faculty are trained as Eucharistic Ministers and participate in the school Masses as well. Families are welcomed and encouraged to celebrate these liturgies with the school community. St. John the Evangelist students also celebrate special feast days throughout the year. On the Feast of St. Francis, students bring their pets to school for a special blessing. On All Saints Day, the 3rd grade students dress up as and present a short biography of their chosen Saint to the other students. We celebrate the true meaning of Christmas with a school-wide Christmas Pageant that retells the story of the Christ’s birth. During Lent, the students participate in the Stations of the Cross every week. In May, we have a traditional May Crowning, and the students say a decade of the rosary together every morning throughout the month, led by the Student Council. St. John the Evangelist is a Catholic school, but we are happy to welcome our non-Catholic students. We are home to many students of different faiths and denominations. All students learn about Catholicism in religion classes and attend Mass with the school.